The Football Widow | A blog about all the awesome stuff I get to do because my husband is obsessed with football! Did you ever do something that was so amazing that you didn’t even have it on your bucket list because it was so out there and never going to happen, but then the opportunity came and you were like, “not doing this thing is not even an option”? I was introduced to Monty Python’s Flying Circus sometime in early high school. My brother and I would stay up late on Saturday nights to watch comedy shows. The lineup began on PBS with the “Britcom” series that began after Lawrence Welk (barf) around 7 pm. After all things Rowan Atkinson (The Thin Blue Line, Mr. Bean, and various Blackadder incarnations), a bit of Are You Being Served?, and possibly some Vicar of Dibley or Keeping Up Appearances, and finally, Monty Python. At eleven we switched to Fox for Mad TV, and at 11:35 to NBC for SNL. In the morning, Mom would yell at me to get out of bed for about twenty minutes. I’d roll out at nine, brush my hair and throw on a dress, and be in the car by 9:15. In Sunday school we yawned through the lessons, bleary eyed from out late night. Bible studies were always intuitive to me. There aren’t a whole lot of stories in the Bible and I usually could infer the lesson intuitively, sleep or no sleep. 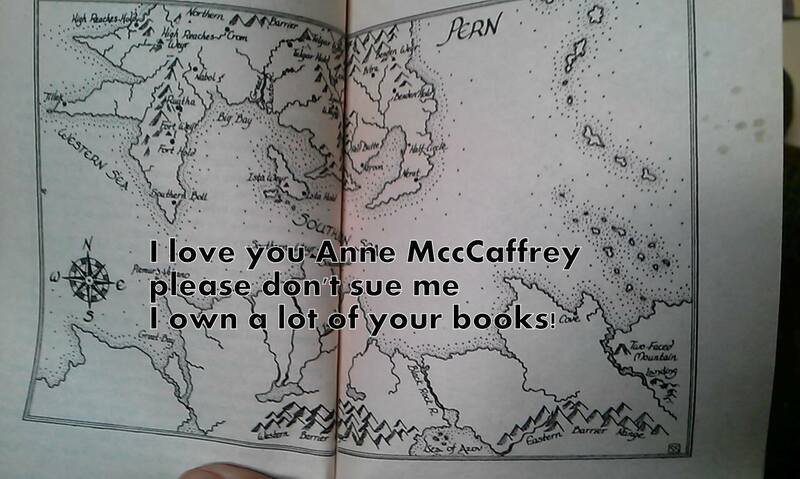 It was totally worth it. We rented Monty Python movies from the video store and received box sets of the TV show for Christmas. I had a crush on Eric Idle. Later, I continued to be enamored with the work of the Pythons. I adore Terry Jones’ work with Brian Froud, including The Labyrinth and the” Pressed Fairies.” Of course John Cleese’s career has probably been the most prolific and his movies and narration are always delightful. I never imagined I would ever be in the same room as any of the Pythons, but last night I was there with two of them! The show was just lovely. Cleese told jokes, Idle sang songs, and both entertained fully with skits and recollections. The finale had us in tears. I had seen the clip before, but never with the background and buildup that we experienced last night. Throughout the show, both men relayed anecdotes about other famous comedians and writers they had worked with, including Marty Feldman. Cleese relentlessly made jabs at Michael Palin, e.g. “Michael is here in the States right now, too, doing a book. He’s not writing one; he’s just a very slow reader.” And of course numerous references were made to Graham Chapman, including a song that Idle began writing when Chapman died in 1989. Seven years later, the Pythons held a reunion at a comedy festival in Aspen and they brought Graham’s ashes so he could be there, too. Go to 8:39 in the video to see what we saw. I’m so grateful that we have opportunities like this now that we live in Charlotte. However, I have to say that the crowd last night was not exactly a cross-section of the Charlotte population. Apparently Cleese and Idle only appeal to white folks. Okay, I saw one Indian lady. But seriously, since moving to the south I have been hyper alert to racial disparity. Our neighborhood is diverse, but once I step out into the rest of the city I see inconsistency in occupation, income, housing, and even little things like who is waiting for a bus. I recently watched You Laugh But It’s True, a documentary about then-future “Daily Show” host Trevor Noah. It’s on Netflix and you should watch it. I doubted Noah’s ability as a South African to host an American social commentary comedic news show until I saw this film. South Africa is mostly known to Americans as that place from which Charlize Theron, Oscar Pistorius, and Nelson Mandela hail. I’ll never forget the first time I heard “1990” By Bob Holman. In college, I attended a showing of A Dry White Season. I haven’t read the book but the film, starring Donald Sutherland, Marlon Brando, and Susan Sarandon, is filled with triggers and will move you to tears. WATCH IT. The horrors of apartheid are still real and raw in the memories of the citizens of South Africa. How does a nation recover from years of brutal racial discrimination? 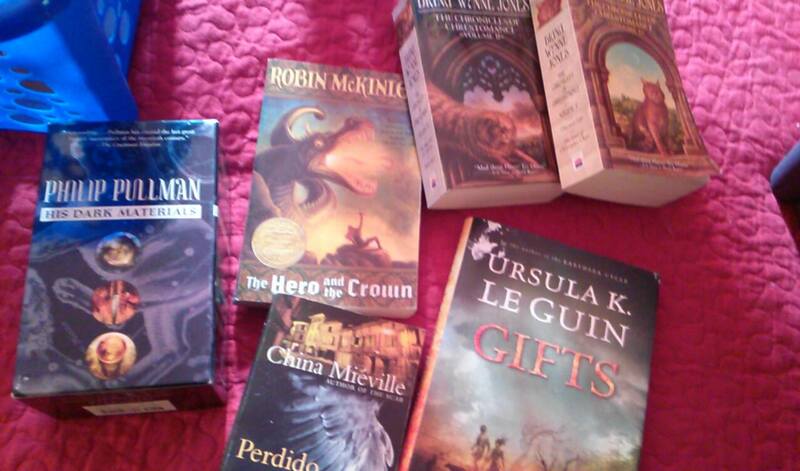 Don’t ask me; I live in the US. We still haven’t figured it out. Trevor Noah was born to a black mother and white father during apartheid in South Africa. Racially classified as “colored,” his parents’ relationship was illegal and his racial identity had to be kept secret. Residence and neighborhoods were dictated by race, and technically mixed race individuals, blacks, whites, and Asians all had to live separately. In the film, Noah revisits the various places in which he lived during his unique childhood. Part of no caste and all subgroups at the same time, Noah’s childhood gave him experiences in all walks of life in South Africa. Coming of age as free speech and desegregation finally came to South Africa, Noah is the perfect storm of comedic success. His talent for perspective, a natural result of his background, makes his appointment to host “the Daily Show” an appropriate choice. Christopher Hitchens once said, “I don’t think it’s possible to have a sense of tragedy without a sense of humor.” Humor diffuses tension and opens dialogue. Pain, whether from the death of a dear friend and colleague or from true injustice, is relieved with laughter. If you’ll excuse me, I now have a strange desire to watch videos of British men in drag. 1. 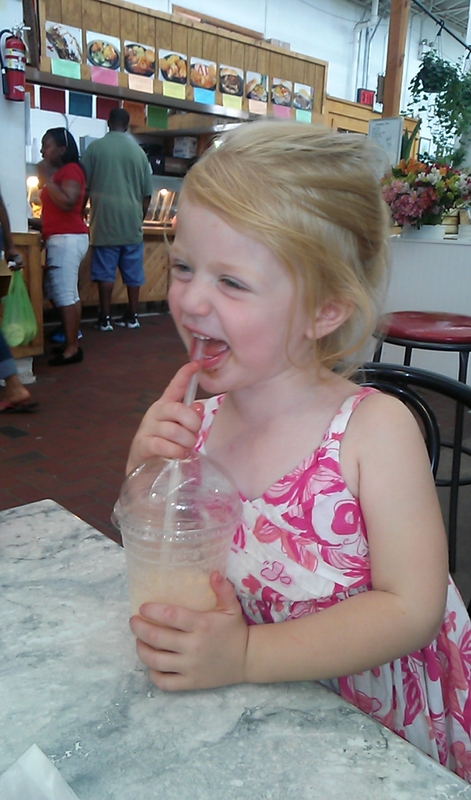 Went to Broad Street Market. Aunt Tanya has a stand called Apple Dumplings Etc. 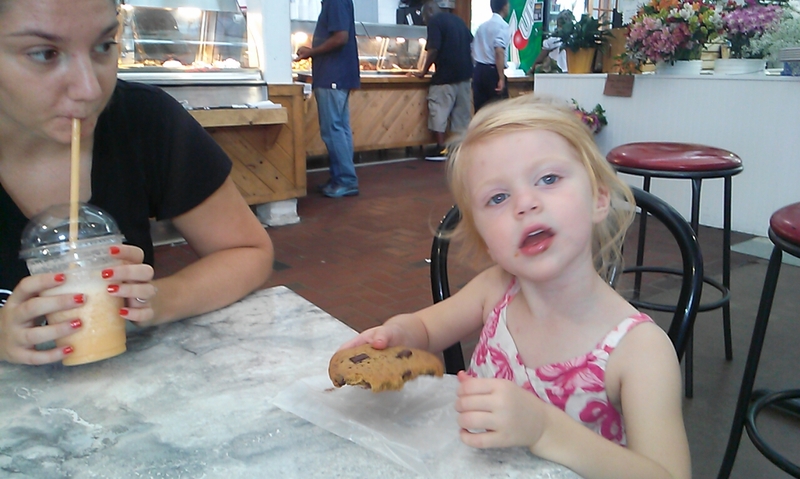 It was too hot for a dumpling but Lexi had a cookie and Emmi and I had smoothies. I bought the Wildberry because Lexi declared that she wanted to have a “purple” smoothie but then she ended up only drinking Emmi’s which was peach. This market is a great place to grab lunch and pick up some produce, meat, and baked goods. It was my first trip but will not be my last! 2. Went shoe shopping. This kid loves to try on shoes, and I was in a work shoe deficit. Now that it is past Labor Day I am supposed to wear stockings and everyonw but the people who wrote the dress code at my wok knows that open-toes shoes look ridiculous with nylons. The trouble with women’s shoes is that one shoe does not match all. 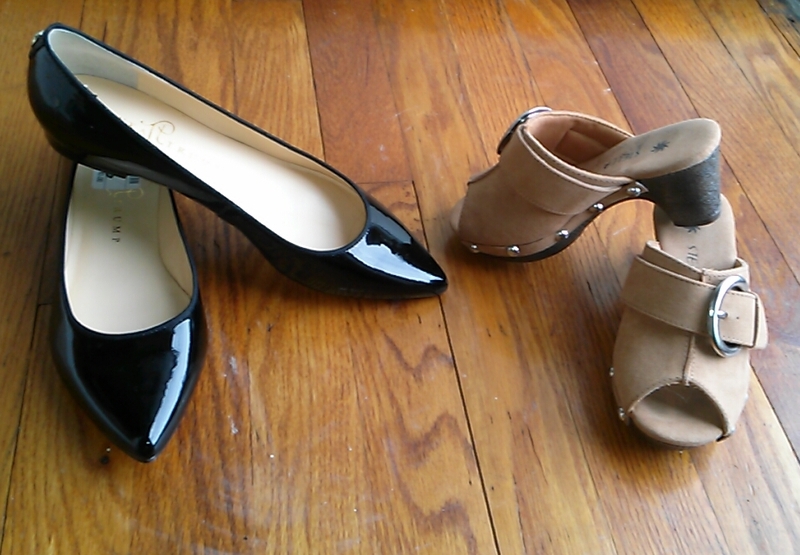 Some outfits call for flats, some for heels. My ankle books are worn out, too. Sheesh, that’s a lot of shoes. I ended up with a pair of flats, kitten heels, high heels, and ankle books in black as well as a sweet pair of blue flats because they were only $8. The best deal was either these Ivanka Trumps for $10 or these ridiculous heeled clogs for the three year old that were only $7. Hey, the kid needs to learn how to walk in heels sometime, right? Quotes from the shopping trip include when she left Emmi’s aisle and somehow didn’t see me in mine. 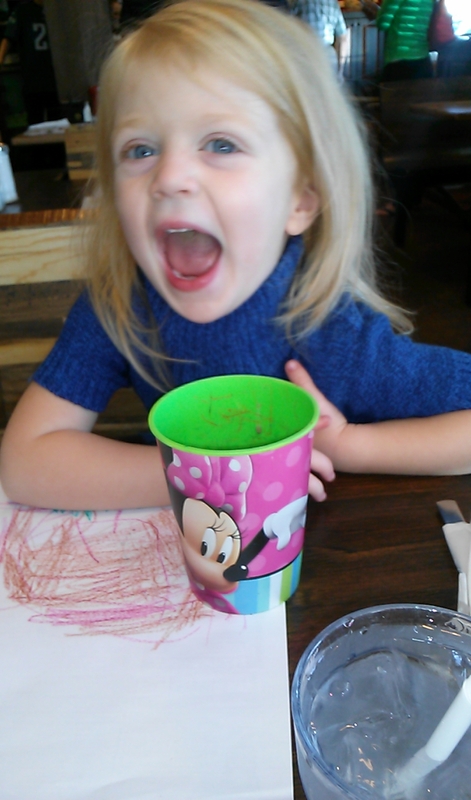 I heard her ask a stranger, “You know where Icky is?” She can’t say “Alyssa” or “Sissy” so her pet name for me is Icky. I’m sure the lady was baffled. The clogs were connected with a string but that didn’t stop her from hobbling around the store in them. 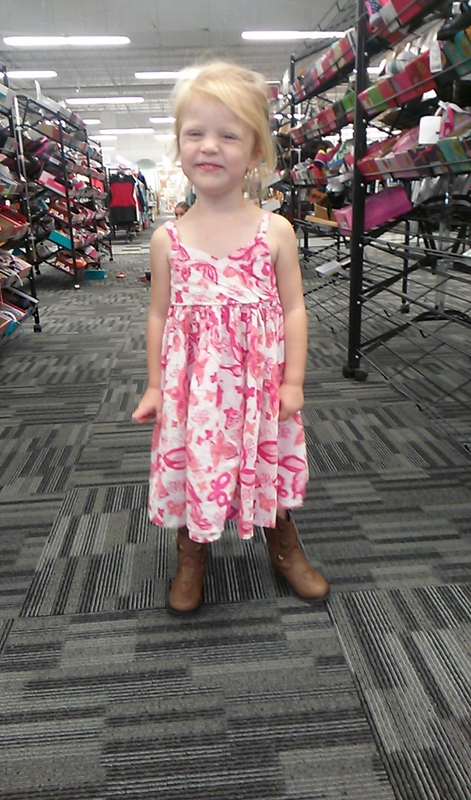 After a few shuffles she pointed to her feet and asked, “Icky, you cut da tring?” Yes, but we need to BUY the shoes first! These boots were too tight…. Competition: Whose shoes were a better deal? 3. Watched a movie. Current obsessions are “Monty Ink” (Monsters Inc.) and “Meemo” (Finding Nemo). We were at Emmi’s house but couldn’t watch a new movie; it had to be Nemo. Whatever. There is nothing like snuggling under the blankets with your loved ones to watch a favorite move and eat popcorn, watermelon, and candy. Her favorite scene seems to be the “Shark Bait Hoo Ha Haa” part. 4. Went “out ta eat.” Kid loves to eat out. Well, me too, so that works. 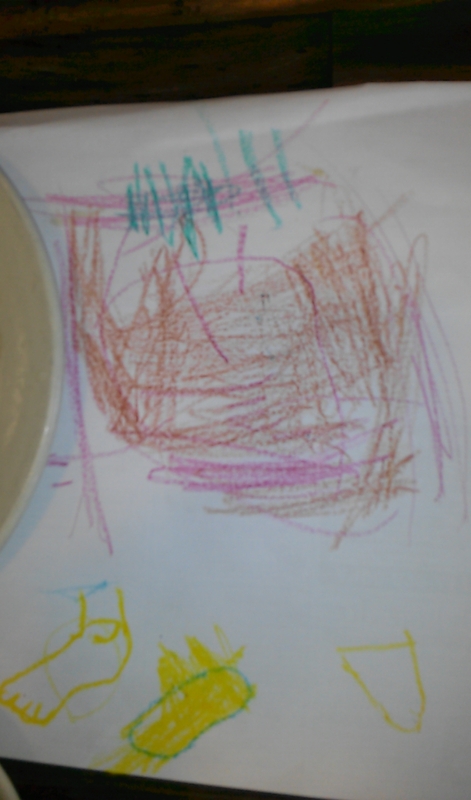 Sunday morning we tackled a Minnie Mouse pancake from my favorite diner and colored with crayons from a Minnie Mouse cup. 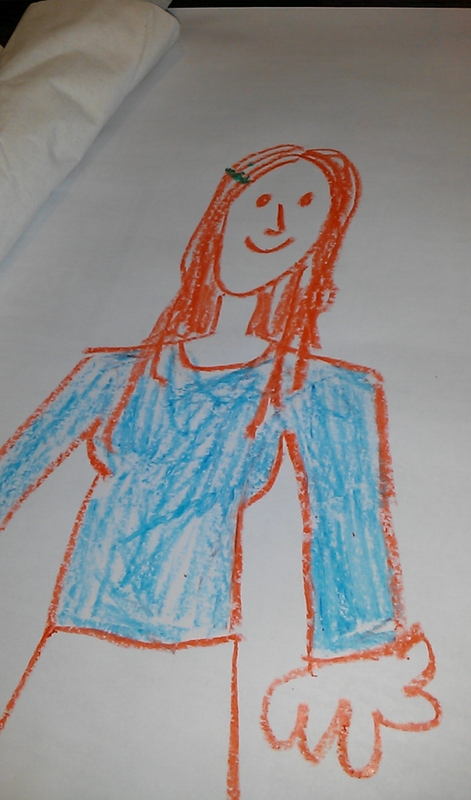 When I asked what we should draw, the answer was “You draw your mommy and I draw my daddy.” Fair enough. My mommy is actually Lexi’s Grammy, so this is a portrait of a well loved lady right here! This is mostly her daddy, but also she asked me to draw some feet. Ask her to get the recipe box. It’s stored where she can reach. When she brings you just a recipe for sugar free cream cheese icing, ask her to bring you the whole box because this isn’t the pink cake recipe. Use Paula Dean’s 1-2-3-4 cake recipe. 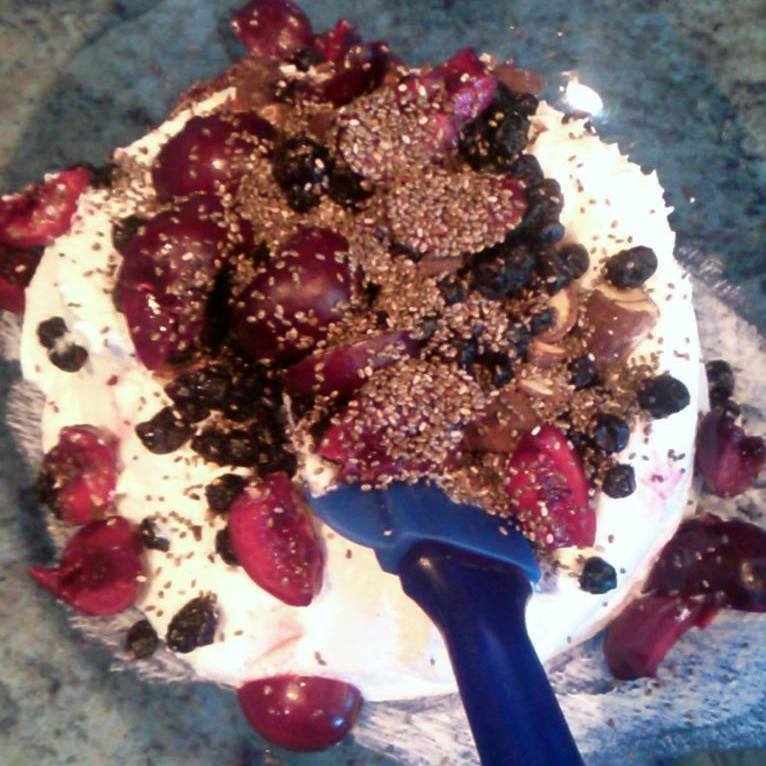 It’s easy and it can be converted to non-dairy. Beat the butter but do not let the toddler stick her finger in the butter. Ask her to get her bench while you unwrap two sticks and begin to beat it. Have her measure two cups of sugar. When she decides to measure with a teaspoon instead of a cup, fill the cup yourself but immediately surrender it when she sees you evening off the top and shouts “No, me!” because she wants to measure everything. Quickly dump into the fluffy butter and continue to beat for about 8 minutes, or until the other ingredients are measured. Because that will take at least 8 minutes. Let her measure baking soda, baking powder, salt, and flour to make about three cups of self-rising flour. Just use the recipe in the back of the red plaid cookbook (Better Homes and Gardens). Let her whisk the flour together. Ask her to go wash her hands because she just stuck her finger in some spilled sugar and licked it. Ask her to count four eggs with you. Crack the eggs into their own bowl and while she is running to the play kitchen to retrieve her tiny whisk because ALL EGGS MUST BE WHISKED AND SHE HAS A WHISK get out the milk and a liquid measuring cup. The eggs actually get added one at a time to the butter/sugar mix and by now the butter and sugar are crazy fluffy to just let her break the yolks and add the eggs slowly to the mixer. Ask her to watch as you pour milk into the liquid measuring cup. We need one cup of milk so just ask her to tell you to stop when we get to “this line” and pour slowly, asking “is that enough” every 2 seconds so she stays focused. Add the flour and milk a little at a time, beginning and ending with flour. Tide the kid over because she is not allowed to add anything to the mixer when it is on by teasing her about the color of the cake. “We’re making a blue cake, right?” “Are you sure you don’t want a yellow cake?” Just laugh when she gets panicked and tearful “NO. PINK!! !” (stomp stomp, pouty lip) Ask the kid to wash her hands because she just stuck her finger in the butter wrapper and licked it. You can turn on the oven now – it will be several more minutes before we are ready to bake this cake. Trust me. Add pink food coloring. Use the gel because it is better but do not let her touch the bottle or the toothpick. “No touchy.” Yeah, it stains. Badly. Remind her that we do not lick the batter yet, her tongue is not pink because there is not enough food coloring in the batter to turn it pink, nobody wants to see her tongue right now, and can she please go was her hands AGAIN because she just stuck her finger into batter and licked it and you promised your friends at work they could have some of these cupcakes. Let her put the cupcake liners in the tins. They are pink and she will do a great job because sorting and matching are developmentally appropriate tasks and she needs the fine motor skills practice. 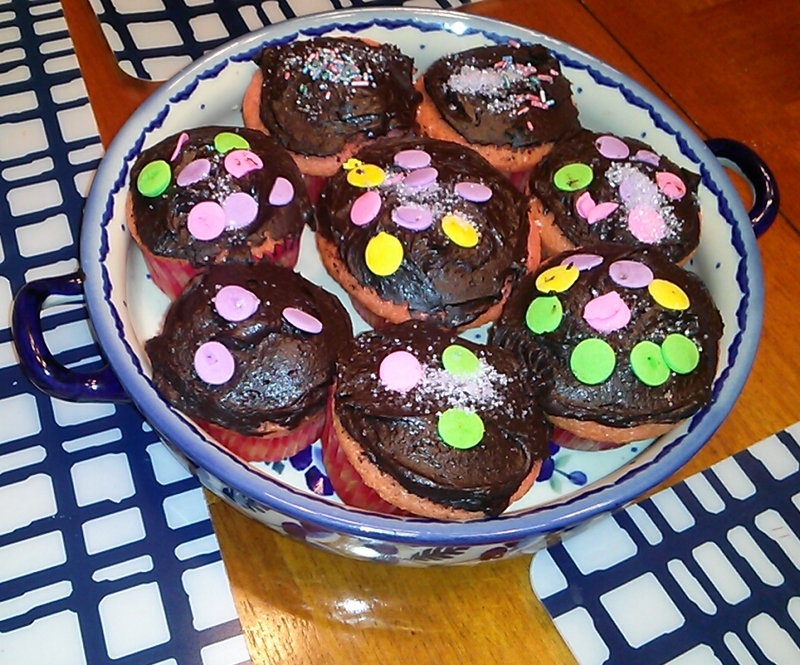 Fix the cupcake liners that are doubled and scoop the batter into the liners. Bake for 25 minutes at 350º. Get everything into the dishwasher immediately because you hate doing dishes and you will need the mixer bowl for the icing once the cupcakes have cooled. Clean the kitchen by yourself because suddenly your tiny helper would rather lick the scooper and put on pretend makeup and costume jewelry than wipe counters. Wipe the flour dust from the sides of the cabinets and ask loudly whose fingerprints are all over the cabinets. Agree when she declares the prints and smudges are the work of Murphy, who is a small gray cat without fingers. Make dinner and eat dinner. Pull the cupcakes from the oven to cool. Play a little and then realize you better get the icing started because it is close to bedtime. Take the mixer bowl out of the dishwasher. It’s in the drying cycle so it’s hot but clean. Curse your bad timing and slow dishwasher. Follow this simple chocolate frosting recipe but use ¼ cup of black cocoa powder to make the frosting very dark. 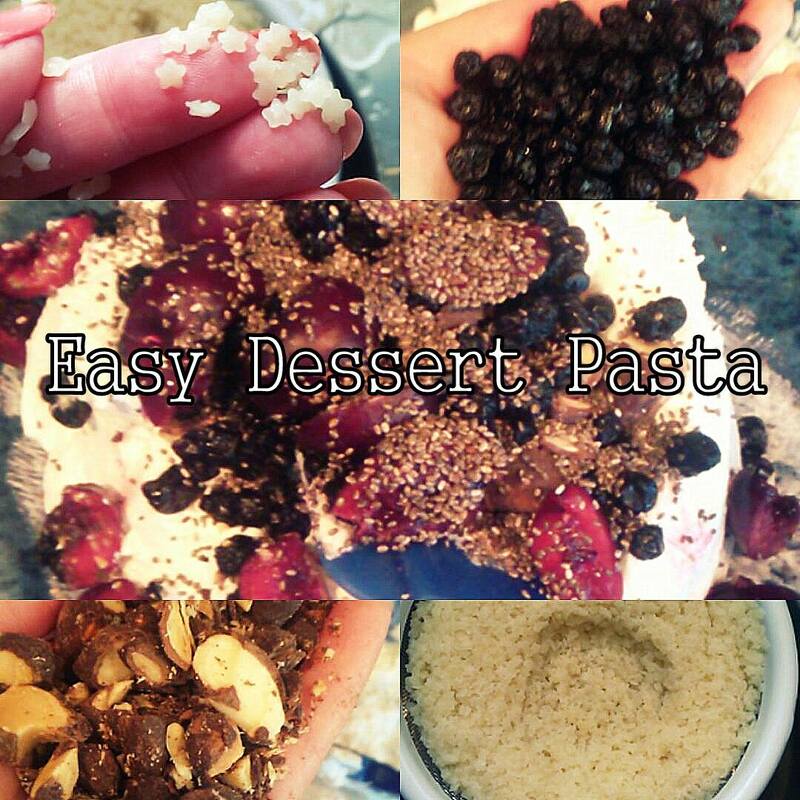 The recipe is pinned on your SWEET NOMS board so you won’t ever forget it! Unwrap the butter while she is washing her hands. Let her measure and even out the cocoa and sugar. It’s her thing and she is REALLY good at measuring. Pick out sprinkles from your epic sprinkle collection. Having this many sprinkles doesn’t hurt anyone. Pick purple of course. Set up the sprinkles for her. Ask her to wash her hands because she just swiped a handful of sprinkles and is licking her fingers. Again. Frost the cupcakes and let her decorate. Since it takes her about a thousand years to decorate each cupcake, decorate the prettiest cupcakes for you to take to work so your colleagues have less toddler spit in their treats. Agree that it is okay for “my take dis cupcake por my daddy.” Pack a cupcake in a container so she can take it to her daddy. Eat cupcakes for a bedtime snack. Swiftly send the kid to do teeth, jammies, and stories because you are god awful exhausted and there is coco powder on your clean kitchen cabinets. Bed is early tonight. Feet hurt.. Thank goodness you have cupcakes! Labor day weekend always marks the start of college football. Time to start entertaining myself! The PYOP studio where we held my sister’s bridal shower closed. It’s a tough business with inventory that can sit for ages. Fortunately, a new place just opened in Elizabethtown! 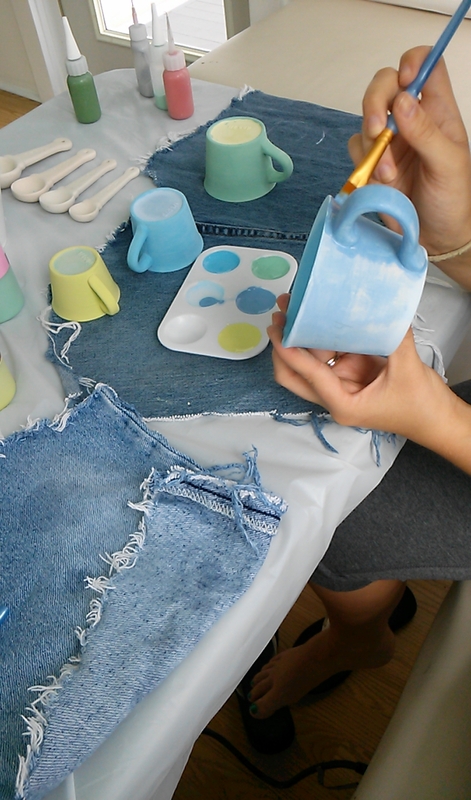 Artspress is more than just a pottery studio. They have an oxygen bar, laughter yoga, espresso and tea, art lessons, writing lessons, Reiki massage and more. The owner, Jeneva, is a kindred spirit who loves art as much as I do! 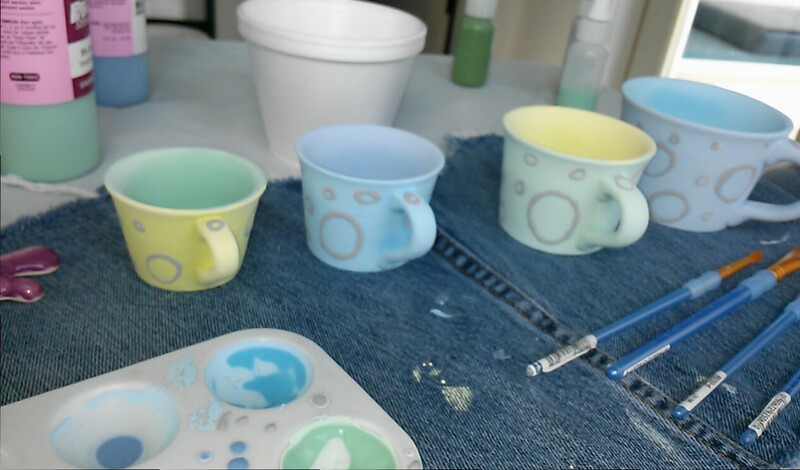 Lea is the detail-oriented plotter when painting pottery. She pencils in tiny details and researches quotes and symbols on my smartphone every time we paint. Once she took two days to complete one piece. I literally brought her back to the studio the next day to finish. Usually her pieces pay homage to a favorite fandom or genre and this weekend’s choice was no different. Artspress had a pie-shaped plate. The opportunities are endless! 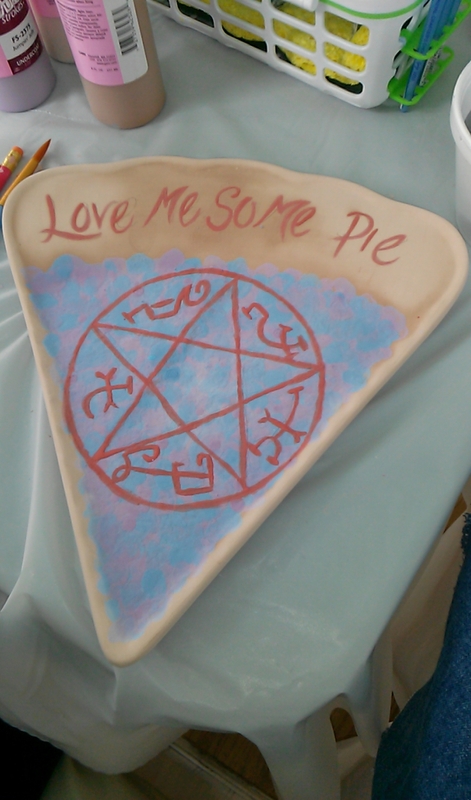 A Pi plate, a pizza plate… these ideas were passed over for the obvious choice – a Supernatural pie plate. 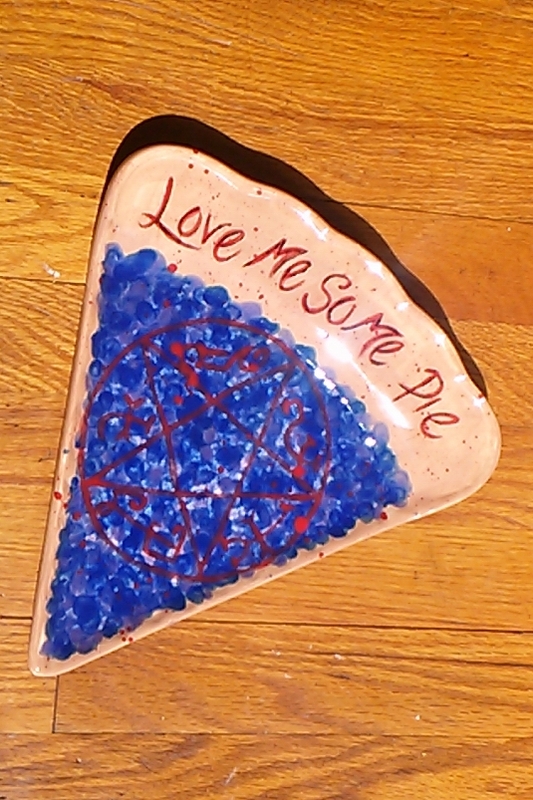 If you don’t get the reference, Supernatural is a TV show that you can watch on Netflix Streaming. In a nutshell, two brothers cross the country in an Impala, staying in tacky motel rooms and slaying demons, ghosts, and other, well, supernatural beings. One character likes pie a lot. It’s an endearing show and if you are mildly interested in the genre of fantasy TV shows you should check it out. Speaking of fantasy/sci-fi TV show fandoms, yes, she is wearing a Firefly tee shirt. 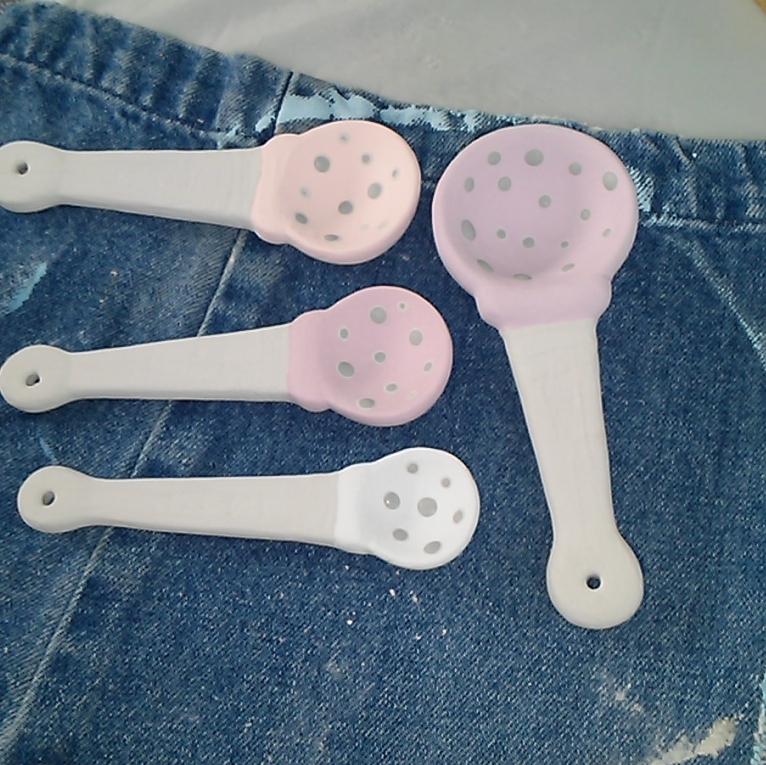 Emmi made a set of measuring spoons and cups. Because she likes to bake and because the set is ADORABLE. 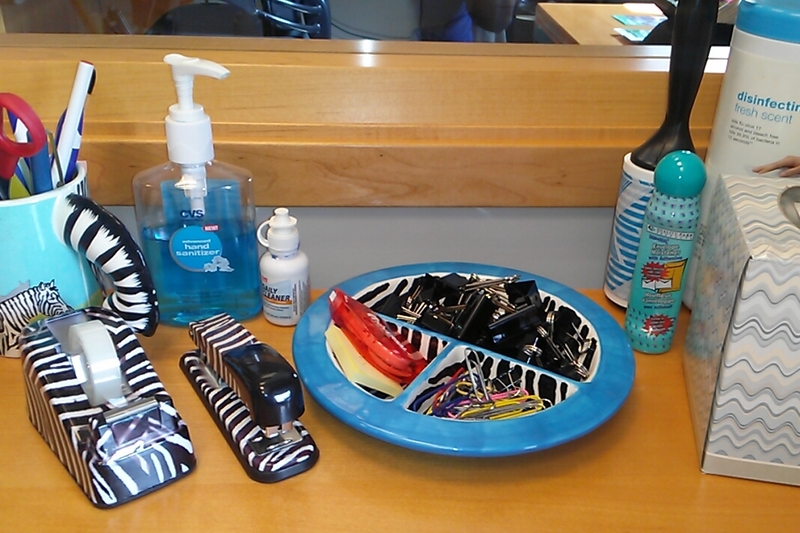 I needed something to look pretty enough for my desk at work to hold paper clips and binder clips. All I have are ugly plastic dip cups and they are stuck in a drawer behind me. 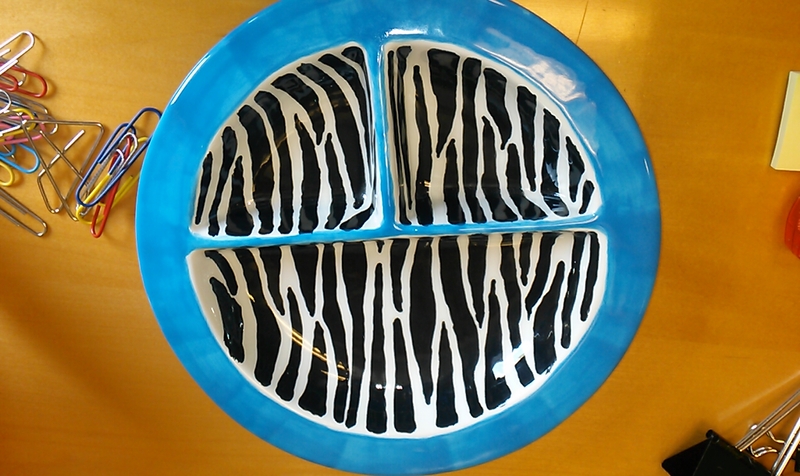 After scouring the inventory I settled on a divided baby plate. So zebra prints have been my thing since before animal prints were hip. I’ve always collected zebra stuff. At my last job I was never given a tape dispenser or stapler or scissors so I eventually tired of borrowing these tools from my coworkers and bought a set at Marshalls – zebra of course. Once I was established in an office again I brought my own tools along. It makes for a cute conversation started with customers. 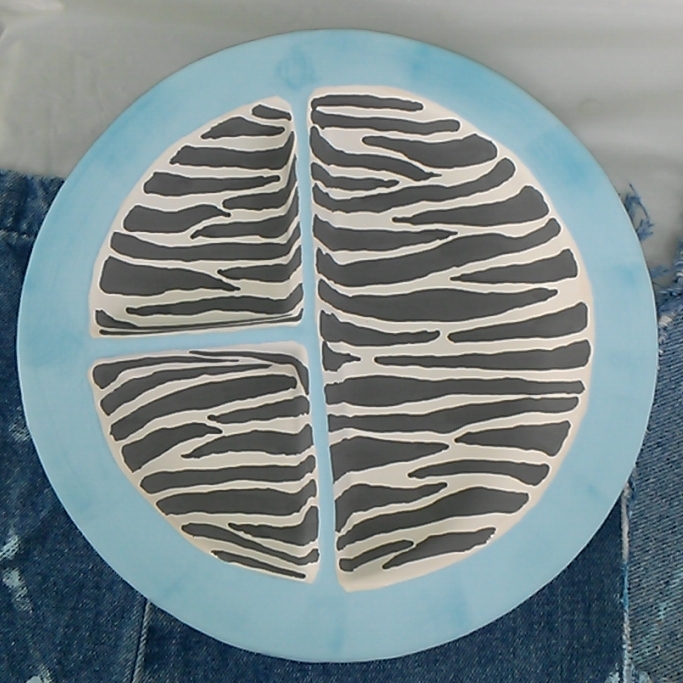 I think the zebra print is easy to paint. This was my first attempt. But that may be because I stare at this pattern all the time. We ended our painting session and Jeneva gave us a quick laughter yoga session. I’m a big believer in smiling to feel happy. I perfected the genuine fake smile as a waitress in college and I’ve utilized it ever since; the weird thing is that after a while, the fakeness fades and you really start to smile because you are cheerful. There was a recent study linking this phenomenon to Botox. It’s a chicken/egg debate in the psychological community whether smiling induces happiness or happiness induces smiling but I for one never considered injecting poison into my forehead until reading this article. They suggest that because you cannot frown after receiving the injections you actually develop a better overall mood. Of course it is possible you feel better because your forehead isn’t wrinkly and old looking. If you can’t afford Botox, Laughter Yoga is a good alternative. Laugh Captain Jeneva lucked out because we three sisters are already at ease with one another and tend to laugh a lot. What can I say; funny is genetic. The interesting thing is that the laughter begins as an exercise without a joke. You just laugh. But it becomes a real giggle quickly as you make eye contact and practice and eventually your muscles and voice just take over. Having the session in a beautiful old house like the one where Artspress operates only helps. Good use of my time on the first football weekend of the season, eh?